The Voodoo Knife Block is fast becoming a design classic – so why not get this limited edition Graphite model to ensure you own a kitchen feature today that will become a family heirloom tomorrow! 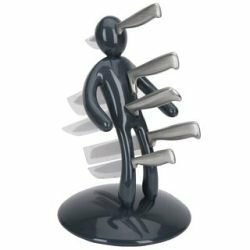 As with all of these knife holders the set comprises the Voodoo Knife Man and five super-sharp cheffing knives. The knives themselves are second to none in their quality and even without the voodoo set would be items to serve you well. The most important things to consider when buying knives are the quality of the metal and the balance of the blade and handle. 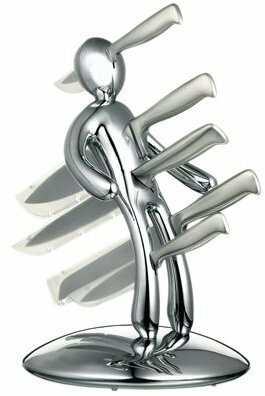 I both of these aspects the knife set is perfect for your needs – whether you are an experienced cook or just a beans-on-toast sort of person.